Iken Barns01728 688899work Self-cateringIken is a reputed base of Boudica and the marauding Iceni tribes who made good use of the commanding position on the south side of the Alde Estuary. Later, in 869AD, a Viking sailing fleet destroyed the 7th Century monastery at Iken. In the 19th Century sailing barges used the river to trade corn and coal between Snape, London and the east coast ports. Now, you will see the occasional pleasure boat whilst taking in the highly regarded SSSI wildlife habitat and the stunning estuary scenery. Views span from the 7th Century St Butolphs Church, standing on a promontory of higher ground, to the former maltings at Snape which are now vibrant with the sounds of the famous concert hall. All of these properties have been converted from a range of former farm buildings (or byres) and now provide high standards of accommodation. Exposed brickwork and ceiling timbers have been retained to give interest. They are approached from the central yard. Lambings, Greenacres, Old Mill and Farriers Cottage have individual patios. The rear outlook is over farmland towards Tunstall Forest. 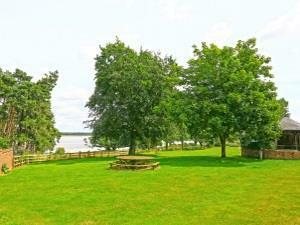 Bay View, Estuary and Gardeners Den have views across the Alde Estuary and to the RSPB reserve at Snape. Estuary has its own balcony and Gardeners Den its own patio. Communal garden is for all to enjoy. The Barns: The Old Mill House (sleeps 3), The Lambings (sleeps 5), Farriers Cottage (sleeps 3), Estuary Barn (sleeps 4), Bay View Barn (sleeps 6) Gardeners Den (sleeps 2) and Greenacres (sleeps 2). Iken is a reputed base of Boudica and the marauding Iceni tribes who made good use of the commanding position on the south side of the Alde Estuary. Later, in 869AD, a Viking sailing fleet destroyed the 7th Century monastery at Iken. In the 19th Century sailing barges used the river to trade corn and coal between Snape, London and the east coast ports. Now, you will see the occasional pleasure boat whilst taking in the highly regarded SSSI wildlife habitat and the stunning estuary scenery. Views span from the 7th Century St Butolphs Church, standing on a promontory of higher ground, to the former maltings at Snape which are now vibrant with the sounds of the famous concert hall.